More notorious than any other diamonds, The Hope Diamond is 45.52 carats. Since the Hope Diamond was found in the early 1600s, it has crossed oceans and continents and passed from kings to commoners. What makes The Hope so notorious is that it is supposed to be cursed. It was once owned by Louis XIV but stolen during the French revolution. In 1830 it turned up in London and was purchased by Henry Phillip Hope, whom it is named. The Hope Diamond is now in the Smithsonian Institute in Washington DC. To read more about the fascinating history of the Hope Diamond visit Encyclopedia Smithsonian on line. 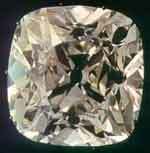 In 1985 a large brown diamond of 755 carats was discovered in the Premier mine in South Africa. Since the stone was considered an ugly duckling, DeBeers decided to have master cutter Gabi Tolkowsky use it for the purpose of testing and cutting methods which Tolkowsky had developed. If anything would have gone wrong it would be no great loss for the â€œUnnamed Brownâ€? as the Golden Jubilee was first know. The end result surprised most, the finished cushion cut stone outweighing Cullinan I by 15.37. In 1995 a Thai syndicate purchased the Golden Jubilee from De Beers. The diamond was then given to King Rama IX of Thailand as tribute on the 50th anniversary of his coronation. The Excelsior was 995.2 carats in the rough. 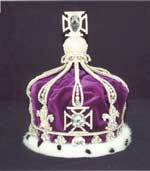 The Excelsior was cut into ten stones, the largest of which is 69.68 carats. The GIA certified The Excelsior I has 'G' color and VS2 clarity. In May of 1996 The Excelsior I was bought by Robert Mouawad for $2,642,000. On February 14, 1972, at the Diminco Mine in Sierra Leone at diamond was discovered which was 969.80 carats in the rough. Harry Winston purchased this diamond and had it cut into 17 stones, six of which are now set in the Star of Sierra Leone Brooch. In 1964, this almost perfect yellow crystal was found in the Dutoitspan Mine, Kimberley, South Africa. It was acquired by Harry Winston, who presented it to the Smithsonian Institution in memory of the late Sir Ernest Oppenheimer of DeBeers Consolidated Mines.